VATICAN CITY (CNS) — As the restructuring of Vatican financial institutions moves into high gear, “our ambition is to become something of a model of financial management rather than a cause for occasional scandal,” said Cardinal George Pell, prefect of the Vatican Secretariat for the Economy. The new president is Jean-Baptiste de Franssu, the French chairman of INCIPIT, a mergers and acquisitions consulting firm. Prior to that, he was the chief executive officer of Invesco Europe, an investment management company. He replaces the German industrialist Ernst von Freyberg, who served as president for the past 17 months, leading the bank through the process of reviewing all its client accounts, culling those not strictly tied to the church and implementing new procedures designed to prevent financial scandals and money laundering. At a Vatican news conference, von Freyberg told reporters that it made sense for him to leave as the institute enters a new phase, one which requires a full-time president — which he is not prepared to be — and one with experience in asset management, which he said he does not have. Cardinal Pell also announced the names of four of the six new members of the bank’s board, including Mary Ann Glendon, a Harvard law professor, former U.S. ambassador to the Holy See and member of the commission Pope Francis had appointed to study the mission and functioning of the bank. Two board members, including an Italian, will be named at a later date, the cardinal said. They replace a board of supervisors, including Carl Anderson, supreme knight of the Knights of Columbus, whose terms have expired. Cardinal Pell, de Franssu and von Freyberg all emphasized the need to continue to consolidate financial operations in a process marked by transparency, coordination, professionalism, ethical values and compliance with the law. The Vatican released an apostolic letter signed by Pope Francis July 8 transferring to Cardinal Pell’s secretariat what had been the “ordinary section” of the Administration of the Patrimony of the Holy See, which will return to focusing on what it was founded to do: manage the portfolio of Vatican real estate holdings and the financial settlement paid by the Italian government in 1929 with the signing of the Lateran Pacts, in which Italy and the Vatican recognized each other’s sovereignty and boundaries. Cardinal Pell also said he and the pope’s Council of Cardinals hope by the end of the year to announce the appointment of a full-time independent auditor general, “not answerable to myself,” but to the Council on the Economy. He said the auditor general can go “anywhere and everywhere” in the Vatican to ensure the entire financial system is operating correctly. Danny Casey, who had worked with Cardinal Pell in Sydney, has moved to Rome and will serve as the head of the project management office in the secretariat. Assuring Vatican employees that the pension fund was “completely secure,” the cardinal announced that the Council for the Economy had appointed a technical committee to study the fund and make suggestions for ensuring its continued health far into the future. As for the Vatican bank, von Freyberg said it is set now to be even more exclusively “a savings and loan for religious congregations,” which make up the majority of its account holders. 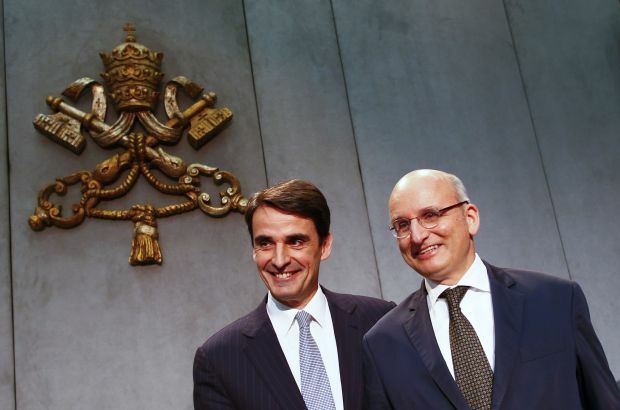 De Franssu said the assets the bank is managing will be gradually shifted — over the next two years — “to a newly created central Vatican asset management” structure. “Obviously,” Cardinal Pell said, “we will have a policy for ethical investments and very obviously, too, all the clerical and lay members who will become part of our boards will have to sign an appropriate document setting out that there is no conflict of interest” and declaring areas where there could be so they would abstain from voting on those matters.